Have you ever seen a Korean historical drama? You will likely have noticed that they all contain a king, his ministers, and a palace. Most Korean ancestors depicted on television are high society figures such as kings and queens. However, outside the palace, there are villages and marketplaces filled with common everyday people who lived and developed Korean culture. Then, from now on, let’s take a trip on a time machine to the center of a village during the Joseon Dynasty to see how our ancestors lived. The Korean Folk Village is a traditional cultural theme park designed to allow visitors to experience and enjoy the traditions and cultures of the period around the Joseon Dynasty. For the purpose, it offers various programs, including standing performances and seasonal events, that make guests feel the origins of Korean culture. In addition, there are various rides, a water park that opens during the summer months, and sledding during the winter. The Korean Folk Village is located in Yongin, Gyeonggi-do, not far from Seoul, and this SMT reporter visited with a fellow reporter with the goal of accomplishing three missions. Upon our arrival, SMT reporters saw many Koreans and foreigners wearing colorful Hanboks at the entrance. 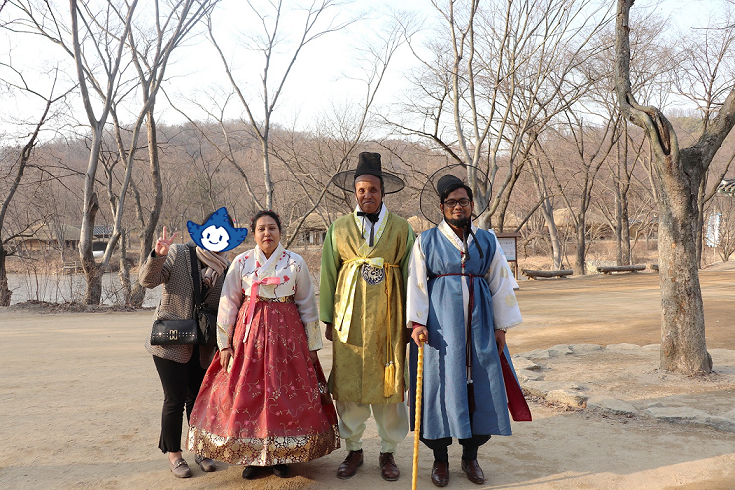 Though they were not wearing traditional Hanboks, this reporter felt like she was traveling back in time. SMT reporters went to the ticket office to purchase admissions tickets, but she was shocked by the cost because it was a little expensive than she thought. For those wishing to only look around the Village, the cost is 20,000 won for the day, but for those wishing to ride the amusement rides, the cost of a day pass is 28,000 won. Additionally, visitors wearing Hanbok or a school uniform or visitors celebrating their birthday on that month can buy discounted tickets. To learn more about that and other discounts, visitors should read the information on the Korean Folk Village website before going. The reporters bought the 28,000 won tickets, and we entered the Village in earnest. The Village is divided into four sections: Store Village, Amusement Village, Folk Village, and Marketplace. At the entrance, there is a stand with information guide maps in languages such as English, Chinese, and Japanese for foreign tourists. After passing through the entrance, visitors come to the Store Village that is filled with stores, convenient facilities, and restaurants all in the shape of traditional Korean houses. Then, passing this area, visitors reach the workshop street where real artisans make straw shoes, crafts, and other items, and after walking past the artisans, visitors go into the core of the Village. SMT reporters joined a tour of the Village to learn more about the past from an expert before beginning the first mission. During the Folk Village tour, the most impressive view was the houses ancestors lived in during the Joseon Dynasty. The countless number of houses in the Folk Village made reporters feel the atmosphere of days long ago. The houses were divided into various types for easy comparison; for example, the Village had different types of houses from different regions, social classes, and uses. In addition, all signs and explanation boards were translated into English, so foreign visitors can easily learn about Korean culture without difficulties. At 3 p.m. People began to gather at the open stage in the center of the Folk Village to see Masangmuye, a martial arts performance done while riding horses. When the troupe appeared with their horses, the arena became immediately alive. Whenever the actors stood up or turned their bodies contrary to their horses, everyone, including SMT reporters, felt nervous. It was amazing and enjoyable, but on the other hand, it was disheartening to think that all the hard training the horses must have gone through. At 3:30p.m. SMT reporters headed to Marketplace after the Masangmuye show for the second mission. Despite the various types of Korean food available, SMT reporters chose to buy a snack called Jjondigi. This reporter had only eaten it as a child many years ago, but it was a popular snack during our parents' generation. 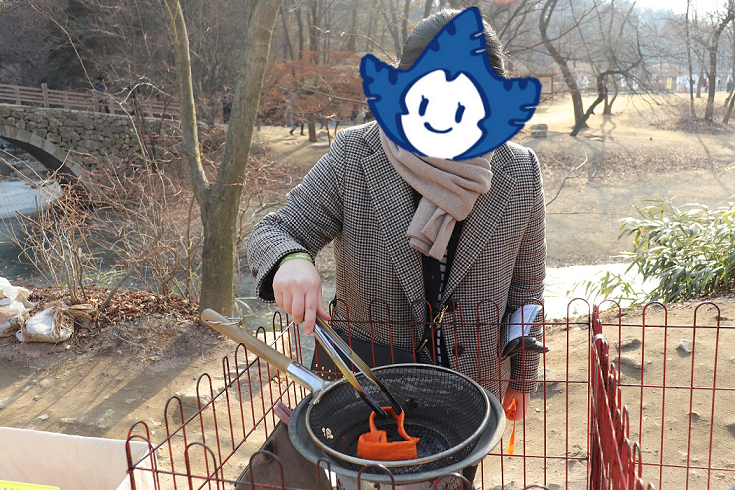 It's a Korean traditional chewy snack that tastes better when it’s roasted on the fire, so SMT reporters baked it in the place provided. At 4:20 p.m. After eating the distinctive snack that tastes a lot like carrots, SMT reporters went to the Amusement Village for the final mission. At the Amusement Village, reporters first dropped by the ghost house; however, as this reporter is quite chicken-hearted, she did not enter but remained outside to take photos. However, this reporter pleasurably rode the Viking taking a seat in the back row. Few people rode the rides due to the cold weather, so the worker allowed reporters to ride for almost four minutes, but actually, reporters felt cold rather than fear and excitement during the ride. Reporters were forbidden from taking photos on the ride due to safety concerns. 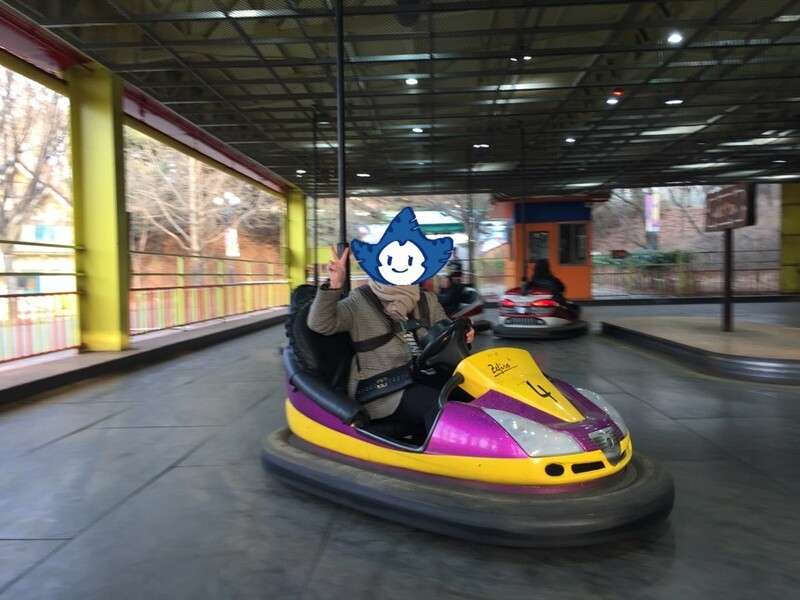 After the Viking, SMT reporter headed to the bumper cars. It was very fun, but the fellow reporter was embarrassed because she got a cramp in her foot. The two hours spent at the Korean Folk Village was well worth the cost, despite moments when reporters blamed the cold weather. The place is lively and offers visitors plenty of attractions and shows. The biggest strength of the Korean Folk Village is it has something for everyone to enjoy and experience. Everyone will gain a sense of Korean traditional culture. Why don't you have a new experience in April, when cherry blossoms are in full bloom at the Village? This SMT reporter hopes Sookmyungians visit and feel Korean culture, which is as beautiful as the flowers of spring.